Britain’s tallest mural ‘Big Mother’ a protest by artist STIK against the destruction of social (public) housing has finally come to the end of its life when the 14-storey social housing block it was painted on was demolished this autumn. STIK says that its destruction has immortalised the meaning behind the mural. Meanwhile, locals were quick to recognise the potential value of the smaller mother and child figure painted at the base of the mural and salvaged the life-size artwork before works began and, with the help of the artist, the piece was stabilised and encased in a sturdy steel frame. Stik and Rachel Pepper from ARTification at Phillips auction (photo LDNgraffiti). The artwork, painted painted on half a ton of brickwork was placed in Phillips auction where it sold for a record £193,750 ($247,500). Proceeds from the artwork, with the second highest price achieved in the sale, has gone to ARTification, a local community arts and cultural charity. Britain’s tallest mural demolished, locals salvage section for sale. Britain’s tallest mural ‘Big Mother’ by street artist STIK has been demolished but locals have rescued a section of the artwork to raise money for their arts program. The 38.2m (125 ft) mural, painted on the south side of social housing tower block Charles Hocking House in 2014, depicts a mother and child figure gazing forlornly out across the West London skyline. So tall it was clearly visible from planes leaving Heathrow Airport the mural became a symbol of protest against the destruction of social housing, a message immortalised by its recent demolition. Local charity Artification, who run a free arts program for council residents fought to salvage the 280cm (9ft) spray-painted brick section of the mural before its demolition, and with the support of the artist STIK have had it stabilised, framed and placed in auction. The artwork, named ‘Big Mother’ after the original mural, is on display at the NEW NOW exhibition at Phillips, London and will go under the hammer on 5 December 2018.
International street artist STIK who prefers to remain anonymous only authenticates the sale of street artworks when it is to benefit the local community. Another of STIK’s street artworks sold at Christies for £150,000 earlier this year. "ARTification is a community rooted cultural arts charity that responds creatively to the needs of local residents. It has been an amazing adventure knowing and working with Stik as he imagined, created and shared the message of Big Mother. We are honoured to now benefit from the Charity Auction of Little Big Mother. The proceeds will enable ARTification to deepen and extend our work celebrating art, culture and community." “I’m a single mum and I used to live on the 9 th floor of the building made famous by the Big Mother mural. We really felt the artwork was for us and it made it a pleasure to come home each day. After they ripped it down they re-housed me and my 10 year old son in another estate nearby and guess what?… they are regenerating this estate too and we know what means”. A rare sculpture by street artist Stik is to go on sale at Christies Auction in aid of homeless theatre company Cardboard Citizens. The life-size, wooden street sculpture, weathered by the elements after almost a decade mounted in London's East-End has finally been brought in from the cold for this unique sale. Estimated between £15,000 - £25,000, the sale is backed by the artist and all proceeds will fund local theatre projects for people whose lives have been affected by homelessness. Sale at Christies, King Street, London on 20th September Viewing from Saturday 15th September 2018. Stik Sculpture Gets Planning Permission. ‘Holding Hands’ representing love and respect between people whoever they are. Big Mother Maquette charity sale at Christies. The hand-painted maquette of the 'Big Mother' mural titled 'Little Big Mother' is to be auctioned at Christies London days before the demolition of Charles-Hocking House upon which 'Big Mother' is painted to draw attention to the importance of social housing. Proceeds will go to 'My Mural', an initiative that enables social housing residents to curate the art on their own estates. Stik and Sheila Chandra to host second ‘Organizing for Creative People’ masterclass. Stik and Sheila Chandra host their second masterclass at Mind, Body, Spirit festival, Olympia, London. The talk is based on best-selling Book 'Organiszing for Creative People' and will include an extensive Q & A session for professional and aspiring creatives alike. Galerie Kronsbein in Munich, Germany has promised not to sell copyright infringing ‘Easter Eggs’ that reproduce STIK's artwork ‘Sleeping Baby’. STIK was not consulted in the production of these works. STIK has no commercial or other relationship with Galerie Kronsbein and he does not endorse the exhibition being held at the gallery nor will he be appearing. The official banner made by artist STIK for the borough of Hackney in the Pride in London Parade will go on sale at Christies Auction. Stik Pride Banner at Christies, King Street this week. Pride Banner at Pride in London 2016. Stik is a London based artist known for his monumental, socially engaged murals and fundraisers for charities and community projects. Stik has been contacted by numerous people asking whether he is involved with the upcoming exhibition at Gallery Kronsbein in Munich. Stik wishes to resolve any confusion by clarifying that he is not associated with the exhibition at Gallerie Kronsbein which is a secondary market sale. Gallerie Kronsbein do not represent or have any business relationship with Stik. 12th December 2016, London/Bristol: A Stik street art piece has been sold at Phillips Auction in London for £35,000 to raise funds for the relocation of the Magpie Social Centre in Bristol. The piece was painted on the outside wall of the building back in 2009 on one of Stik’s trips to the city and was rediscovered shortly before the collective were evicted earlier this year. 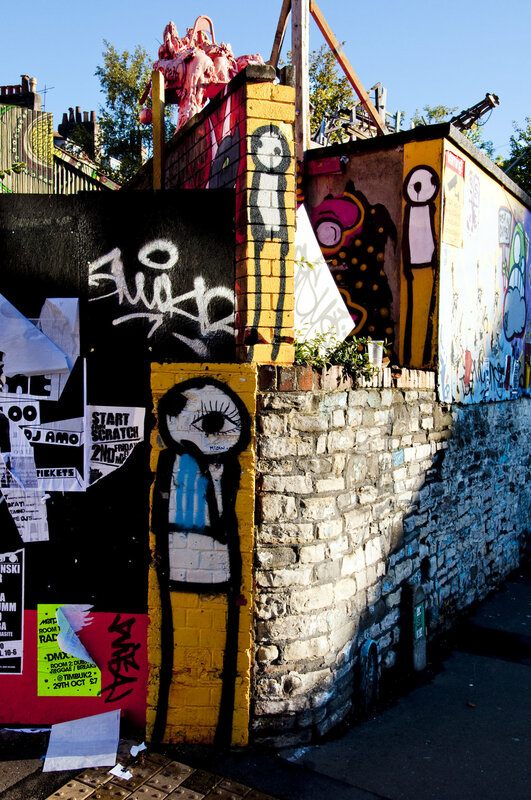 Stik only permits the sale of his street artworks when the money raised goes directly back to the community and he readily agreed to help them place the sale. The collective who formerly squatted the vacant lot for 10 years are now browsing various properties in the Bristol area. Stik with Natty Lee form Magpie Social Centre at Phillips Auction Private view. Signed, dated and authenticated 'STIK 2009 2016' on the reverse. Spray paint on wood, in artist's frame. Executed in 2009. This work is accompanied by a certificate of authenticity issued by the artist's studio. This lot is an original street art work from the front wall of the Magpie Social Centre in Bristol, which had to give up its premises earlier this year. The artist has agreed to authenticate the panel so that proceeds can fund the relocation of the social centre. Street Artist Stik has agreed to authenticate and approve the sale of a street art piece he once painted on the front of the Magpie Social Centre in Bristol. This piece appeared in 2009 on the front wall of the not-for-profit social centre which was evicted earlier this year and is currently looking for a new premises. Stik only authenticates street artworks when all proceeds benefit the community they were painted for. The artist was approached by the community centre earlier this year and helped set up the sale with London auction house Phillips. The piece titled ‘Magpie’ has been preserved, framed and logged and comes with a certificate of authenticity. This fundraising system has been set up to counteract the removal and unauthenticated trade in street artworks. Win a pair of signed, un-folded artist’s proof Stik posters at Strand Books. Anyone who buys a copy of ‘STIK’ or brings in a pre-purchased copy of the book to Strand Books for Stik to sign is eligible to enter a lottery to win a pair of artist’s unfolded, cardstock Stik posters, signed by Stik himself. The posters, one orange and one teal, are number one of only five artist’s proofs and depict the same image seen on the folded poster in the book (pictured). Stik will be signing copies of his book ‘Stik’ published by Penguin at Strand Bookshop. The historical venue is just minutes away from Stik’s iconic water tower ‘Union’ on Union Square. For the first time ever Stik shares his personal archive of working photographs and recounts the social and personal motivations behind each of his murals in this beautifully designed and produced art book, from unauthorised pieces painted on the streets of East London when the artist was homeless through to the giant international murals for which he has become famous. This book is the culmination of 15 years of work and is a unique insight into the artist’s world. This 220 page hardback edition is bound in lush red canvas and finished with black and white foils. The first edition comes with a free, limited edition lithograph poster in one of two unique colours, Teal and Orange which Stik will be signing on the day. Central London June 25th 2016.